Fill the whole quilt, quilt it in rows, do it in groups of two a la Charlie brown’s sweater, or in groups of three, wide and tall, or short and narrow. Whatever floats your boat. This simple graphic quilting pattern adds a lot of WOW to a quilt. Obviously, you can do this design on a Zig Zag quilt by echoing the block lines. I like it! It adds movement to a quilt, up and down. Or turn it on it’s side for left to right movement. This one requires a lot of pivoting. A sewing machine with a knee lift sure comes in handy right about now :) You only need to mark your first zig zag, then use your guide bar or edge of your foot to echo your previous line. Marking is a breeze if you use existing points on your quilt (like the corners of blocks) to mark your first row. 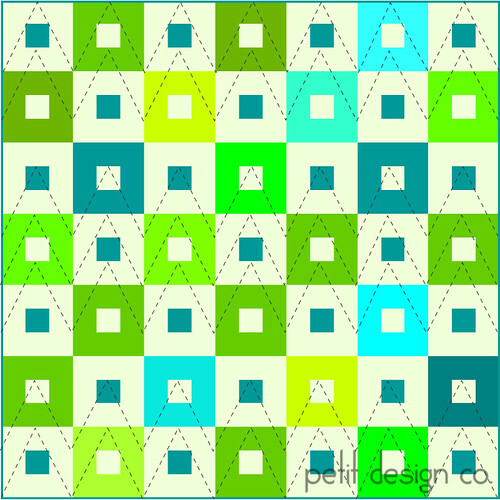 Had you thought to use this design on a non-zig zag quilt? Good idea. I'm using a zig zag quilting pattern on a mini quilt today. I think they are a little more relaxed than the ones in your picture. So I don't have to move the quilt so much. So far, I like this quilting method, too. Yeah! I've been waiting for this one. I keep wanting to try this but I keep chickening out. I think I'll do it on my next quilt. Maybe.